Over-the-counter (OTC) pharmaceutical products that have kosher certification are far and few between. That is why the announcement of the STAR-K certification of various Mylanta brand antacid and anti-gas products is monumental. Kosher consumers can now find Mylanta Liquid Antacid & Anti-Gas (Maximum Strength Classic, Maximum Strength Vanilla Caramel, and Tonight Soothing Honey Chamomile) and Mylanta Gas Minis (Assorted Fruit, Cherry, and Mint Tablets), distributed by INFIRST HEALTHCARE under license from McNeil Consumer Pharmaceuticals Co., on shelves throughout the US at national retailers such as Walmart and Walgreens. 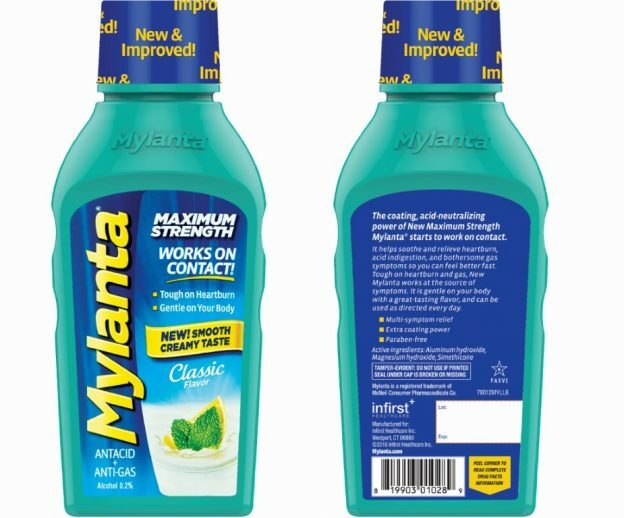 “We are thrilled to expand Mylanta’s accessibility through the launch of our new and improved products and meet the needs of all heartburn sufferers nationwide.” said Gigi Leporati, Mylanta’s Marketing Director.